Probably one of the most widely recognized animals of the African plains is the Blue Wildebeest (Connochaetes taurinus), or “Wild Beast”, the name being of Dutch origin as Dutch settled much of South Africa in the 1700’s. They belong to the family Bovidae, which includes antelopes, cattle, sheep, goats and other even-toed horned ungulates. It is by far the most abundant big game species throughout its range in east and south Africa. This animal has been around for millions of years and are some of the most prevalent fossils associated with habitats of early man. Because of their odd shaped head, long shaggy mane and long limbs, the locals refer to them jokingly as the“spare parts” animal. Wildebeest are herd animals and tourist marvel at the large herds numbering in the thousands in their annual migrations across the African plains. As with most animals male competition for territory and females during the mating season, which coincides with the rainy season, is fierce often resulting in battle injuries. The winner, of course, takes the spoils of victory. Not to worry though. There are so many Wildebeest, each male usually gets a second chance. 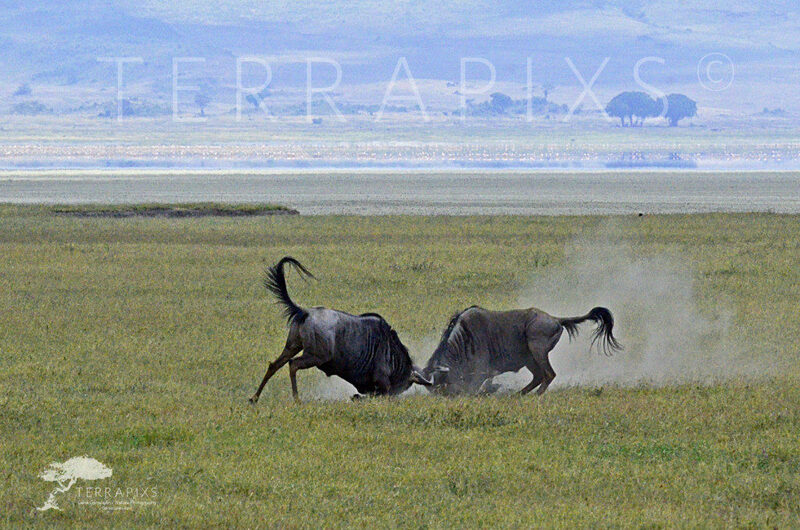 That the Wildebeest and their calves are a substantial food source for many predators, including man, is accepted. They are an integral part of the thread of life. The two males in this picture are in Ngorongoro Crater Park, Tanzania, a truly beautiful place that is referred to a the Garden of Eden so lush and full of life it is. If you get a chance to visit Africa do not pass it up. You will surely enjoy it!